New York shopping, alongside London, Milan and Paris, is considered one of the four fashion capitals of the world, with a wealth of high street department stores and fashion outlets selling clothes and accessories to suit every budget. In this New York Shopping guide, we’ll take a look at the New York shopping scene, giving the lowdown on the best places to shop for bargains, designer clothes and electronics. New York is home to a number of discount department stores boasting designer clothes at affordable prices. These shops have hidden gems waiting to be found, normally at a fraction of the original retail price. It’s not unheard of to find Versace, Armani and other high end designer label clothes hidden amongst the clothes racks lining the stores. Century 21 – Found between Church St. and Broadway, Century 21 has gained a reputation as a bargain hunter’s paradise. The displays are messy and the racks unkempt, but there are bargains to be found everywhere. Century 21 can get crowded in the evenings, however, so try to visit in the early morning if possible to get there before the crowds arrive. Syms – Found at 400 Park Avenue, Syms offers clothes from a number of designers, including Kenneth Cole and Tommy Hilfiger, with cut prices discounts of as much as 80%. Male, female and children’s clothing are all available here. Loehmann’s – Found at 101 Seventh Avenue, Lochmann’s offers a variety of different types of designer clothes with discounts ranging from 40% to 70% off high street retail prices. Jersey Gardens Outlet Shopping Mall – located 25 minutes away from Manhattan in the suburbs of New Jersey, Jersey Gardens is home to over 200 stores with goods priced at up to 70% off retail prices. Brands such as Abercrombie & Fitch, Gap, American Eagle and more can be found. Jersey Gardens can be reached by bus from the Port Authority Bus Terminal with a return ticket costing $10. Woodbury Common – Located 60 minutes away from Manhattan, Woodbury Common houses the largest collection of high end outlet stores in the world with over 220 outlet shops selling clothing from Burberry, Dolce & Gabbana, Gucci and many other brands. Woodbury Common can be reached by bus from the Port Authority Bus Terminal with a return ticket costing $42. Downtown Manhattan is home to large numbers of department stores and high fashion boutique stores with clothes available from all four corners of the globe. While prices are higher in Manhattan than in the discount department stores or outlet malls, there are still many bargains to be found. Fifth Avenue, arguably the most well known shopping strip in the world, is home to the flagship stores of a number of different designers and department stores. Well known budget department stores like Uniqlo, Zara and H&M can be found alongside higher end department stores like Bloomingdale’s and Saks Fifth Avenue. Madison Avenue, another street found in Manhattan, features a number a of high end boutique stores from some of the world’s best designers, including Armani, Dior, Etro, Prada and more. 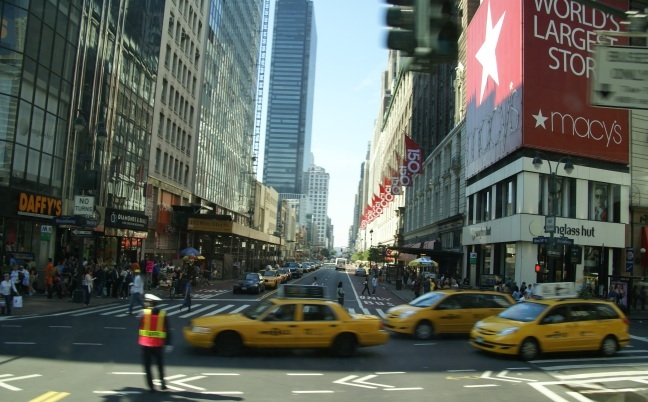 The world’s department largest store, Macy’s, can also be found in downtown Manhattan. Boasting 11 floors filled with clothing from a variety of different designers, Macy’s has something for everyone. -B&H Photo Video – Found at 420 9th Avenue, B&H Photo Video stock a variety of cameras at low prices. -J&R Music and Computer World – Found at 23 Park Row, J&R Music and Computer World sells a variety of audio/video equipment as well as computer equipment. -Best Buy and Circuit City – Best Buy and Circuit City are two of the most popular electronics chain stores in the USA, with a number of stores in New York. Due to their size and ability to buy electronics in bulk quantities, Best Buy and Circuit City sell all types of electronics at low prices. Apple products can also be purchased at much lower prices than in the UK. A 16 GB iPad, for example, costs £75 less in the US than it does in the UK. Apple’s flagship store, found on Fifth Avenue, is an ideal location to purchase Apple products. NYC experiences all four seasons with hot summers and brutally cold winters, meaning clothes can be bought to suit any climate. Summer clothes are often discounted during the winter months, with winter clothes going on sale during the summer months. During the Christmas months, from Thanksgiving onwards, Christmas sales become commonplace, making New York an ideal location for Christmas shopping. Bargains can be found in stores on the high street while discount department stores and outlet malls further discount their prices for the holiday season. Every visitor to New York should indulge in some shopping: there are few places on Earth that can boast the variety and value for money that New York can. Explore, take a look around and visit some shops – you won’t be disappointed. Further shopping suggestions can be found here.